- Little rascal where is your mother? She's gone out voting. - Petit Malheureaux ou est ta mere? - La Citoyenne Maman est allee voter! "Ces coquins de'enfants"
Ordering Information: Contact Catherine Palczewski at catherine.palczewski@uni.edu for permission requests and to order high resolution digital copies. Fees will be attached if the image is intended for commercial use. 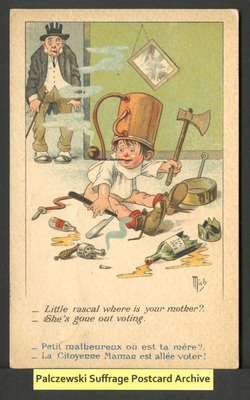 Original print postcard is in the public domain; U.S. and International copyright laws protect this digital object. Commercial use of this digital object not permitted without prior permission of copyright holder.